29 November – Ukulele Night! Note that this is just a list of events organised (either solely or in part) by the Village Hall Committee. Other events are held in the village hall, such as The Pantry, and these are listed in the main Village Calendar in What's On. 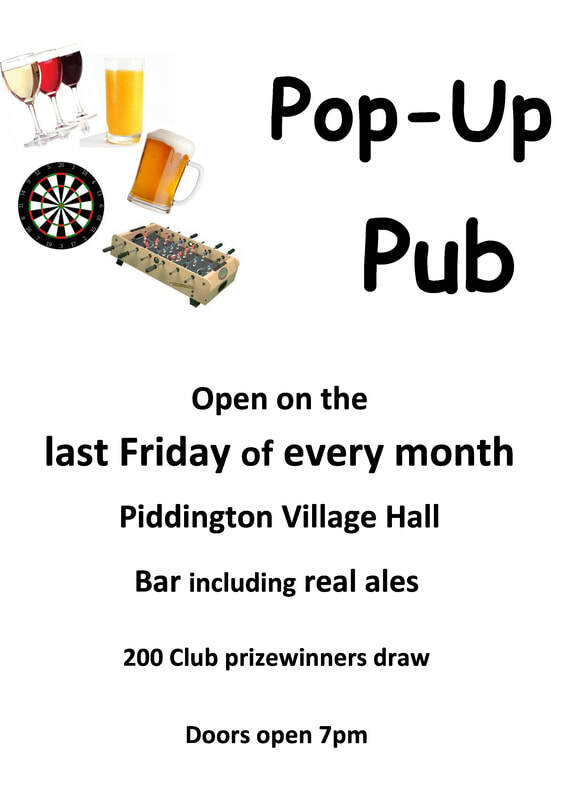 The Piddington Pop-Up Pub is open regularly on the last Friday of every month unless otherwise advertised. Please drop in, have a drink and a chat or a game or two, and shake off the cares of the week. If you haven't been to a pop-up pub before, why not give it a go. If you're new to the village, it's a great way to get to know people, and if you're not, it's a good way to catch up with your neighbours. And if you think you'll just see the same few old codgers who seem to turn up for everything, you'll be surprised! Lots of new people have moved into the village in the last year or so, and many of them regularly drop in to the pop-up pub. Whether you pop in for a quick snifter or an evening of darts, you'll be very welcome. Do come to one of the events held in the village hall. If you're new to the village, they're a good way of meeting your neighbours, and if you're a seasoned Piddingtonian, you'll probably know that they're a welcome place to meet up with friends and catch up with the gossip. Activities are usually well advertised on the village noticeboards, in Parish Matters magazine, on this website and on the Piddington Facebook page. And if you have any ideas or suggestions for activities you'd like to see put on in the village hall, please let one of the Management Committee know. The village hall belongs to everyone in Piddington, so please tell us how you'd like to see it being used. Several groups use the hall on a regular basis. For details, see the list here or the Bookings Calendar.